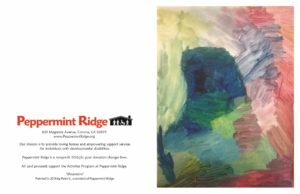 When you make a donation to Peppermint Ridge you are helping to provide a quality of life that every Ridger deserves. 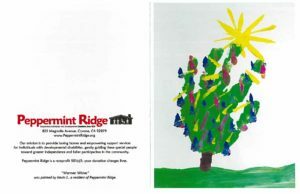 Your contribution will make a difference in the lives of the Ridgers. Recreation, food, transportation, clothes… your gift will support all facets of a well-balanced life. Sign up to give a monthly gift of $10.00 or more. It is quick and simple. The amount you choose to donate will be charged monthly to the card of your choice. Donating has never been so easy! 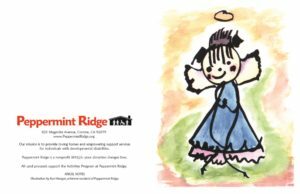 Sponsor one (or all) of our yearly fundraising events like Peppermint Possibilities Dinner and Auction in February or the Run the River for The Ridge 5K and Half Marathon event in September. Attend our elegant Peppermint Possibilities Dinner and Auction, or lace up those running shoes and run in our 5K or Half Marathon. 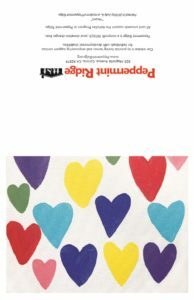 We have four greeting card designs for sale, $20 for a pack of 12 with envelopes. Cards can come in a mixed pack of your choosing. The artwork on each card was created by a Ridger. All card proceeds support our activities program. If you are interested in purchasing, please contact Communications Specialist, Althea Wagoner at 951-833-0691, awagoner@peppermintridge.org. Christmas Card inside reads, " Warmest Thoughts and Best Wishes for a Wonderful Holiday Season!" Tributes are a beautiful way to celebrate special occasions, honor family and friends, and to remember loved ones. Would you like to fulfill a wish by donating one of the following items? Our Ridgers and staff truly appreciate all gifts. Canvases – all sizes welcomed. On your first visit to AmazonSmile smile.amazon.com, you need to select "Peppermint Ridge" to receive donations from eligible purchases before you begin shopping. Then every eligible purchase you make at smile.amazon.com will result in a donation. You Can Also Become a Volunteer By Clicking Here!